Puppy deposits are non-refundable. Your deposit holds your puppy and is a commitment to purchase your new family member. When paying the puppy deposit you agree that you have read and agree to the puppy contract. 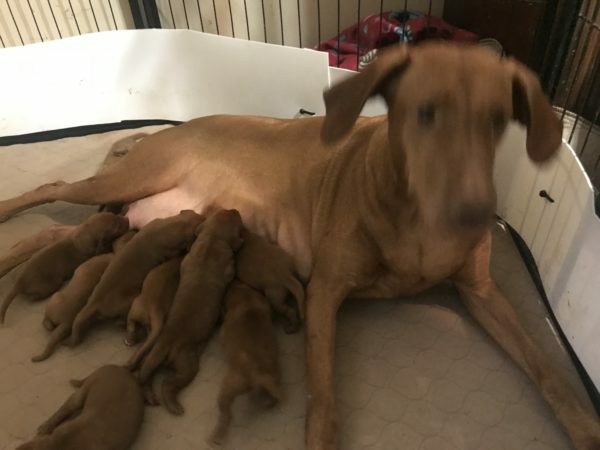 Our litter of Vizsla puppies from Remington & Rugar have arrived. 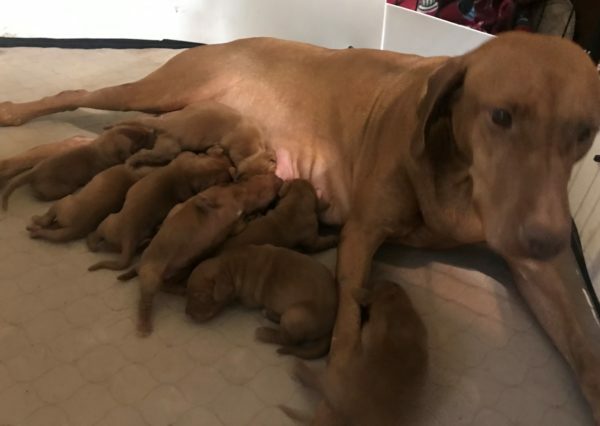 There are 9 Vizsla puppies (4 Boys and 5 Girls) born on March 16th. Remington and the puppies are doing great. They had their tails docked and dew claws removed and their first Veterinarian check up. For this special litter is our beautiful female Remington (She is the daughter of our amazing Bella). Remington has an excellent conformation and is a sweet, spunky, and intelligent Vizsla girl. Remington has a great temperament and disposition. She gets along well with the other dogs. Remington does great with young children, teens, and adults. Remington is very loyal and just wants to do whatever we are doing. There has been over 45 years of hunting and competing bred into her genes and her pedigree. 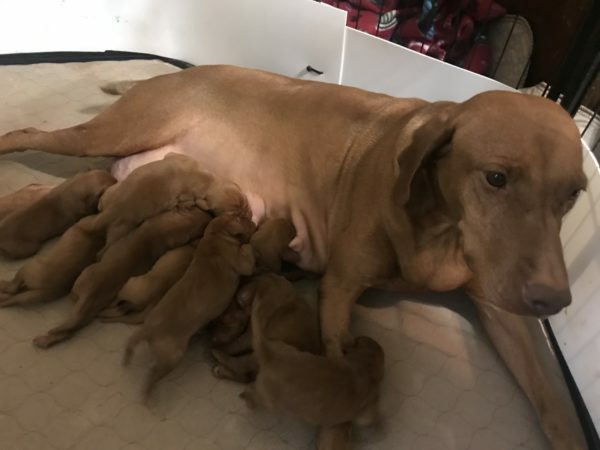 We are extremely proud of Remington and are expecting that this litter will produce puppies capable of being able to compete in confirmation as well as hunting competitions or just making the ultimate family companion. 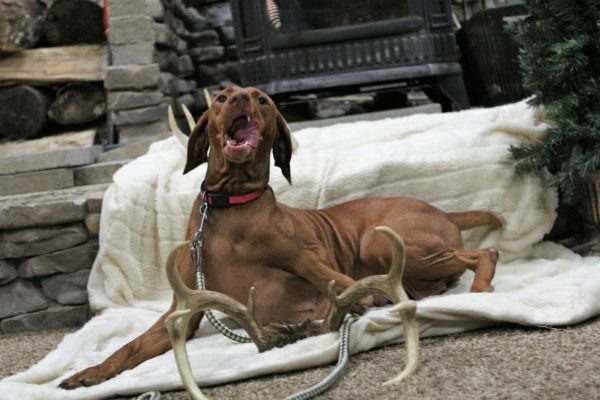 Remington has Championship bloodlines that come from some of the best well-known Vizslas out there. Her pedigree’s loaded with champions as well as some Dual Champions and Hall of Fame Vizslas. 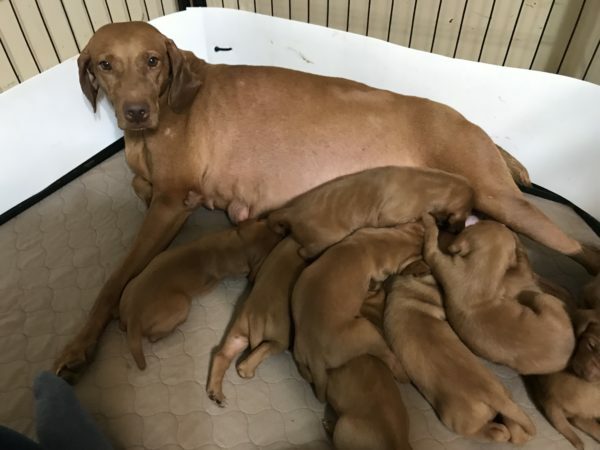 Some of the dogs in her pedigree have produced many of the champions that are responsible for where we are today with the Vizsla breed and all the accomplishments they have made. This litter will be sired by our Rugar. A great Bird Dog and loyal family member. Rugar is a really gentle and attentive male. When in the field Rugar is hard-charging with great drive and stamina. Rugar also has an amazing pedigree and has some of the popular Vizslas available. With the qualities of the Sire and Dam, we are looking forward to seeing some great pups from this litter. 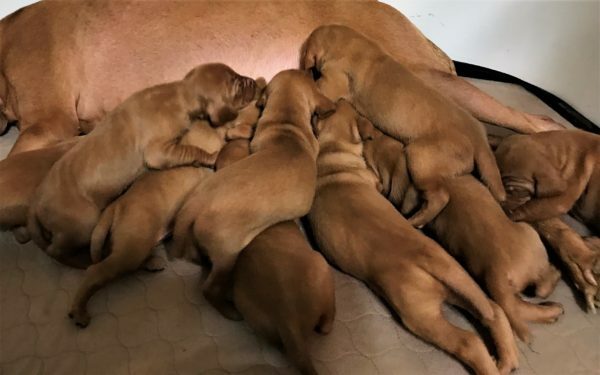 Under the proper environment, conditions, and training we feel that these pups will have the potential to become competitive hunters, field trial Champs, winners in the show ring or maybe just that new special family member. 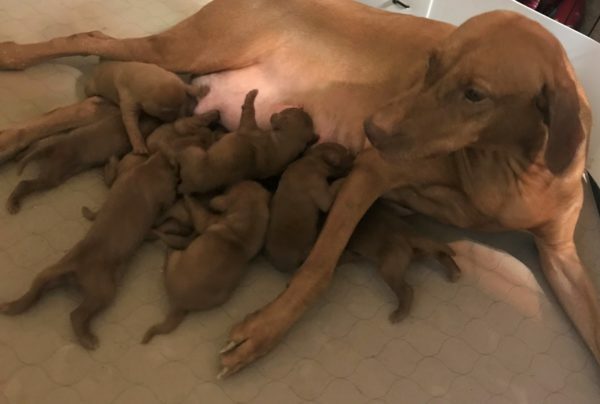 All of our Vizslas are very healthy, and we’ve never had any issues or signs of genetic defects in any of our Vizslas. We take lots of pictures plus we have a weekly video showcasing the litter. All of our customers love the videos. They allow you to get to know each pup and see the differences. The videos help you when choosing your new family member. 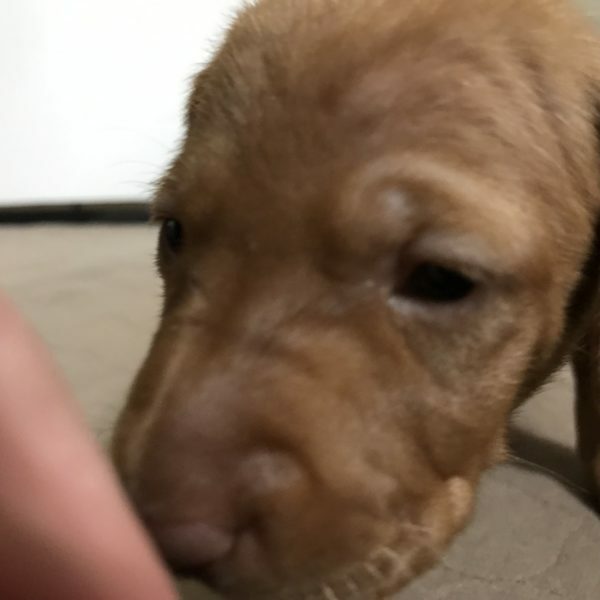 You will see the puppies as they grow and get to see the whole beautiful process of our babies grow from day one to when they go home with you. For those picking up their puppies and the pick process will be on May 11. For those having their puppy shipped the shipping date will be May . All pups will have been dewormed several times and up to date on their vaccinations. The tails will be docked and dew claws removed properly by our certified Veterinarian. We have a health guarantee against genetic defects plus assure you that you’re getting the healthiest puppy possible. Shipping is available for an additional $350 within the United States excluding Hawaii and Alaska. 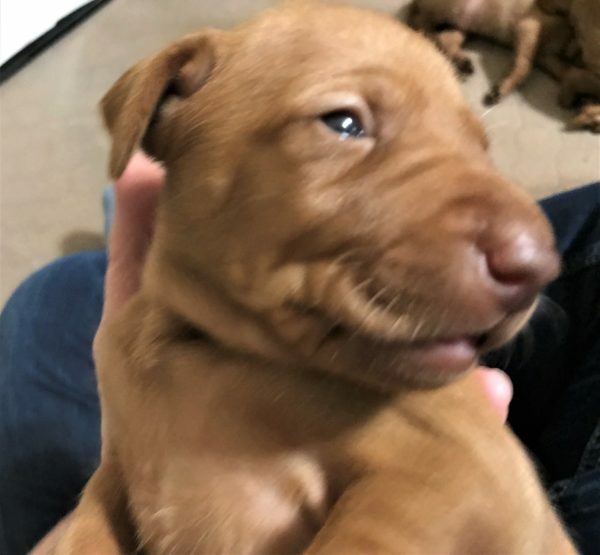 The total cost for your Vizsla puppy is $1,600. The balance is due when picking up your puppy or 10 days prior if your puppy is being shipped.